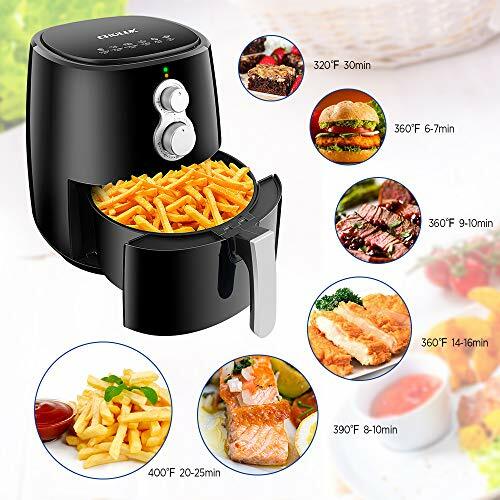 【Keep Healthy & Save Money – Health Multi-functional Fryer】 The CHULEX air fryer cook the fryer food without oil, which lower 70% fat, make fried healthier and lower Calories. The sealed 360 degrees hot cycle technology make the food fast crisp taste. 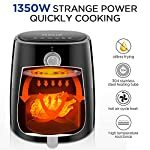 With this oilless cooker, you can not only safety DIY your favorite frying or grilling food with our recipe, like Chicken, French Fries, Beef, Corn Cake, but also Cake, Bread without buying expensive professional oven and fryer. 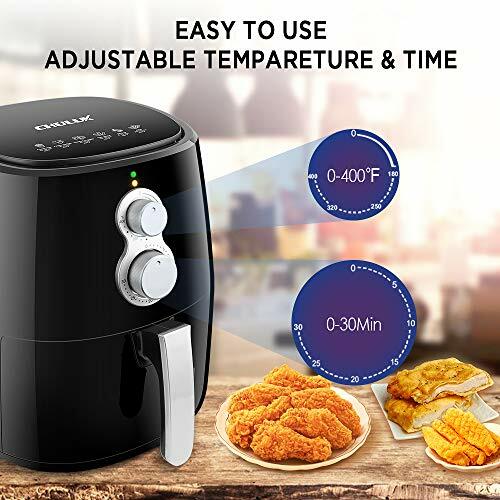 【Saving Your Time and Laber – Easy to Use & Clean】With 30mins timer and adjustable temperature from 0-400 degrees, you only put in the food, then rotate button to set the suitable time and temperature, the air fryer start frying, which will auto shut off after reach your setting time. No need your too much attention. 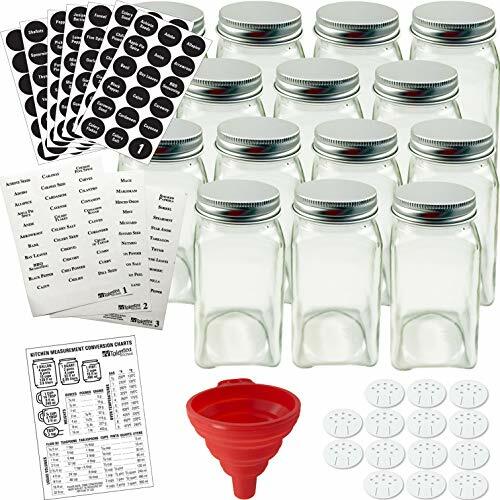 The oven and baking tray is safy non stick oil material, dishwasher safy, easy to tear down and clean. Looking for a healthier, tastier, easier way to make the meals you love? CHULUX Automatic Air Cooking Fryer must be the answer! 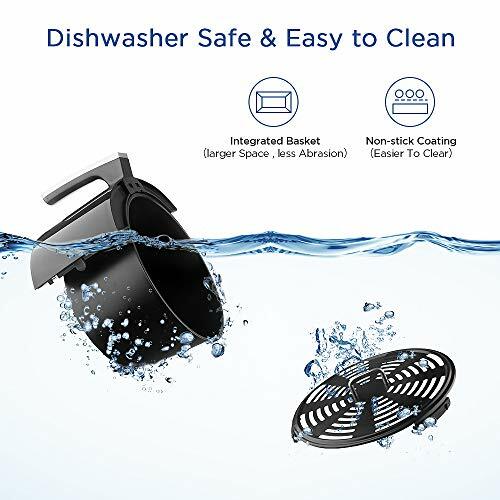 Unlike traditional fat fryers,with fast-circulating hot air,it means heat-up time is instant, the heat cooks food more evenly and cooking times are faster. As well as using less fat, the vapours and odours of fried food are reduced so all you enjoy is the tempting aroma of delicious cooked food.And ideal for trying out the wide variety of dishes found in our CHULUX recipe. 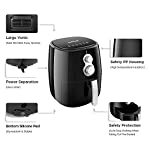 What makes CHULUX Air Fryer different from other fryers? 1.Fry,roast, bake or grill a variety of ingredients making it without oil smell and splatter,reduce fat, keep flavour. 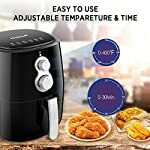 2.Powerful air frying technology with rapid hot air circulation enable you to cook delicious food within 30 mins or less. 3.Power & heating indicator lights lets you know when your cooking cycle is start and over. 4.Variable temperature control 180°~400°F,giving you total control over the food you are cooking. 5.The oil free airfryer will shut off automatically when the timer expires. 6.4.2 Qt. 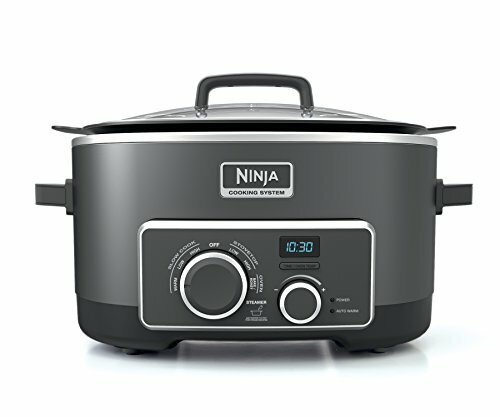 capacity easily allows cooking up to 2lbs food,enough for a family. 7.Removable Pan and Cool touch handles make you easy to pour the fired food into dishes. 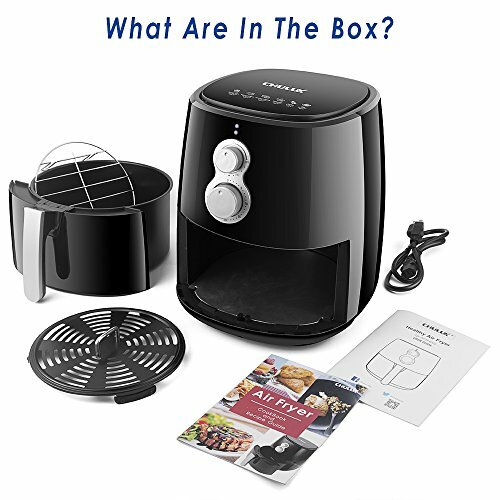 8.Non-slip feet – meaning the compact air fryer is sturdy whilst in use. 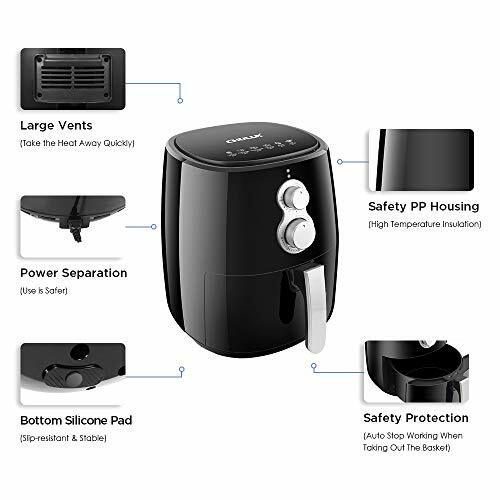 【Guarantee Operating Safe – Auto Shut Off & Memory Feation 】We have known the air fryer will auto shut off when finishing cooking. 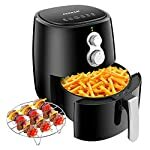 If you want add some condiment or roll food when the airfryer is working, you can just do it and needn’t turn off the power. When then pot take out, the power will auto shut off to ensure you saft. 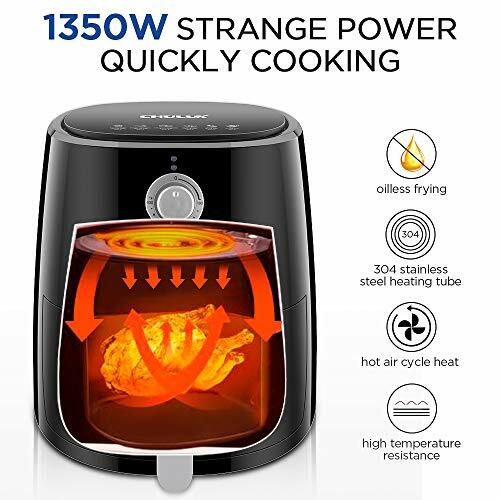 After you reput the pot into again, the air fryer with previous memorywill auto restart work without you operiate again. 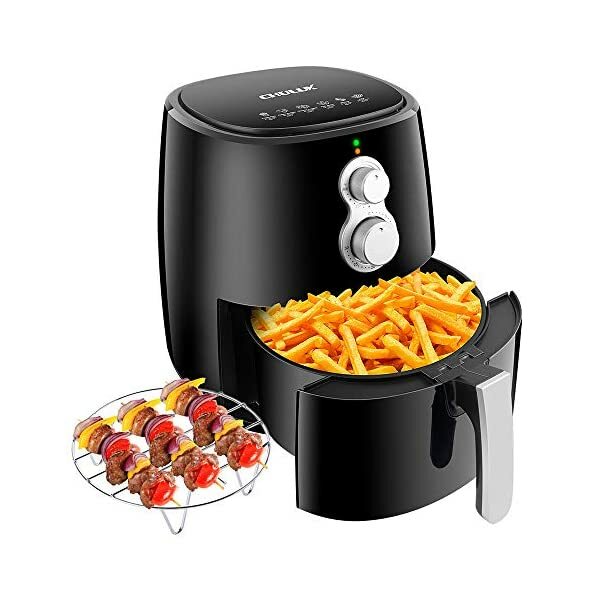 【Save Your Space – Small Size & 4.2qt Large Capacity 】This air fryer have integraed basket, smaller size than other brand with separate fried basket. 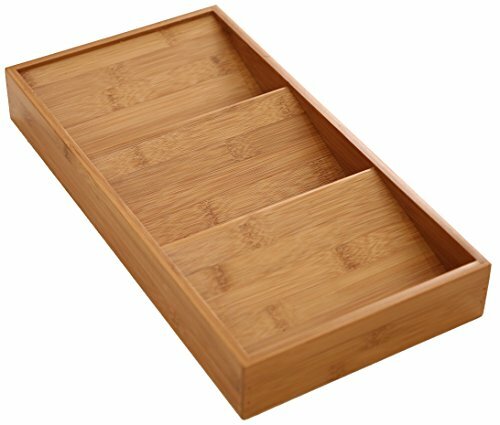 So it save your kitchen space and integraed basket can reduce wear. 4.2qt capacity meet your family needs, is so suitable for family gatherings, parties, festivals. 【Guarantee Your Shopping Experience – One Year Warranty】We provide one year warranty. If you have any problem whether the time beyond the warranty，you can contact us at any time. We will make you satisfied. 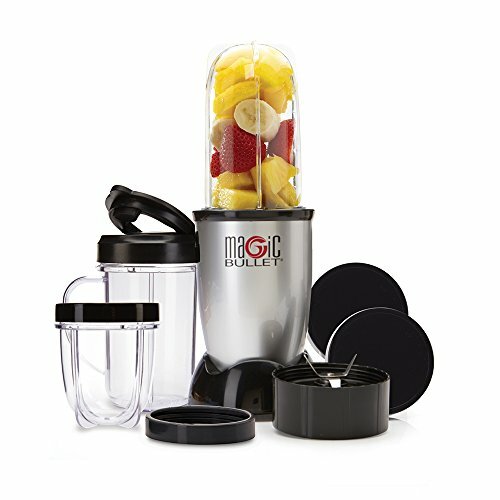 Now enjoy healthy delicious food without worrying about oil splash soil your kitchen or your face.